I am in love with Cherry Blossoms! 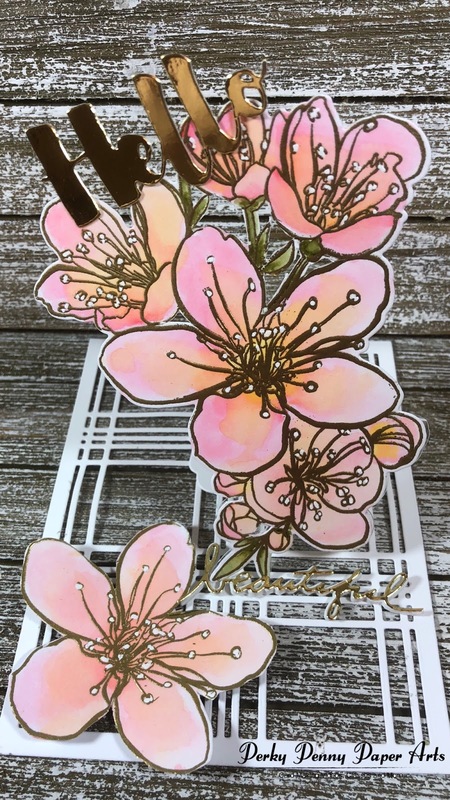 They are so fun to color that whenever I see a Cherry Blossom stamp, I simply have to have it. The new Mondo Sakura (Cherry Blossom in Japanese) and coordinating die from Ellen Hutson are no exception. This set has another quality I love in my flower stamps: they are HUGE!!!!! Having all that space to color is just dreamy. At first glance this card may seem complicated to create but I am here to dispel that myth. To create this card, you will need 2 sheet of 5" x 6" Hero Arts Acetate (one cut to 4 1/4" x 5 1/2" and one folded on one side at 1 1/4” inch on the 6” side); 2 sheets of 4 1/4" x 5 1/2" 110 lb white card stock (one cut with the cover die of your choice, and one folded in half and cut with the 3rd largest die from the Infinity Tag Frames Die set by Hero Arts [so you have 2 tags]); and 2 sheets of 4 1/4" x 5 1/2" Bristol Smooth card stock (to stamp and emboss the Mondo Sakura on). I will color both and use one as a whole and cut up the other one to have a few flowers on the base. A list of additional supplies is available below. After heat embossing the stamps, I went about coloring them using my Zig Clean Color Real Brush Markers. My coloring for these flowers is very simple. I took the Light Carmine, and applied it to the inside part of each of the petals on the flower, making sure to have more ink where it will be dark. I then wet my brush and dabbed it off on a paper towel so it isn’t too wet and spread the color around the flower. I then took the Yellow Lemon marker and applied some color in the center of the flower and used my wet brush to pull the color out onto the petal. I repeated this process until I was happy with how my flower looks and then went on to the next one. When I finished coloring all of my flowers, I usde my Olive Green Marker and applied ink to about half of the stem or leaf. I then used my wet brush to spread the color out. I repeated this process for the second flower arrangement and then set them aside to dry for a few minutes. When they were dry, I took my White Gel Pen and filled in all of the stamen with it. This creates a nice little pop on the flower. I then set them aside for another few minutes to dry -- you know how gel pen can be. I then cut my flower arrangements out with my dies. Time to create my easel. Hero Arts has great packs of acetate that are perfect for shaker cards. This is a lighter weight acetate which works well with die cuts so it is perfect for this project. To create the easel, I first folded and creased the 5” x 6” panel at 1 1/4” inch on the 6” side. This will be the section I use to attach the easel to the card base. I then took the larger section and folded that in half towards the other fold line and then flattened it again This will help me create the easel card when the piece is die cut. To die cut the easel, I placed the mondo sakura die hanging over the fold slightly, attached it with some Post-it tape, and ran it through my die cutter. Now I have my little easel to pop up the flowers on the card. I will attach this to a card base. In this case it consists of a 4 1/4” x 5 1/2” piece of acetate for stability and a 4 1/4” x 5 1/2” piece of white card stock run through the die cutter with this cover die from Altenew. It is part of a 2-die set that creates a wonderful plaid effect for your projects. I attached these 2 pieces together using dotted tape runner to keep the acetate as clear as possible. I start my assembly by attaching the flower to the easel and then trimming up the back side of the easel to make it even more invisible to the recipient. I do not trim any of the plastic that is adhered to the flowers or the base that will be attached to the card base. Just the pieces on the middle section that are hanging off to the sides. I then apply glue to the bottom of the easel and use the straight line of the die cut and flower to position the flower on the front of the card before I push it onto the base. I cut a tag out with the Hero Arts Infinity Tag set and tried it out in different spots, with and without a gold frame. I chose a plain white tag in a size that would mostly hide behind the flower. To decorate the base of the card even further, I fussy cut the large flower out and applied it to the card base with a foam square. This will give the bouquet a place to anchor when it is popped up. I glued the tag “inside” my card and then applied the sentiment -- this fun little “beautiful” die that came with the Mondo Sakura die set -- with a layer of foam underneath for dimension and a cute little “hello” die also from Ellen Hutson. 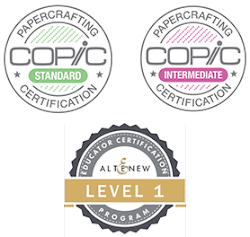 I am so excited to be sharing my Level 1 challenge for the Altenew Educator Certification Program. I was asked to create a card for a teenage boy or girl, with a choice of several categories. I chose an encouragement card for a teenage boy because I always love a good challenge. The other requirement was to use 3 elements from the classes I have taken so far in Level 1. I chose 3 elements with a very basic thought: many a teenage boy is not going to keep a card forever, so I wanted something simple, quick, and fun for me to make. I reviewed Lesson 1 of the Clean & Simple Boutique class to zero in on this concept for my card. I decided on no dimension to keep it as simple as possible and a few elements to still have a fun card when I was done. Besides an A2 white card base, this card only needed a 4" x 5 1/4" white panel to stencil on, a scrap for the sentiment, and the super cool Tim Holtz Idea-ology Metallic Kraft Stock (silver) cut to 4 1/8" x 5 3/8" and another piece to cut out my letters. I attached the silver rectangle panel to the card base. Using the Altenew Weave Builder Stencil, on the white panel, I created my background by using a sponge dauber with Limestone and Dusk inks from Altenew. This has to be the coolest stencil ever! It makes me a little dizzy to look at it :) I then centered the completed panel and attached it to my card base. The inspiration for this was by the Seasonal Scene Building class, Lesson 3, which teaches about building backgrounds using a number of different methods. I cut the word DUDE out of the metallic paper using the Altenew Caps Bold Alphabet dies and attached them to the front of my card. I was inspired to do this by the Let It Shine class, Lesson 5, metallic paper. Who doesn't love shiny things and what is cool about this paper is it has that Tim Holtz rustic quality to it that is very hip. I stamped You Are Awesome! from Altenew's Label Love stamp set, in Dusk ink, trimmed it, backed it smidge larger white scrap, and added it to my card front. And then we are done! I hope this card would be encouraging to a young man who is doing his best to be an amazing person. Lord knows that can be quite a challenge in and of itself :) I also think this would make a great all around guy card that could be mass produced and kept on hand for birthdays, thank yous and other occasions. 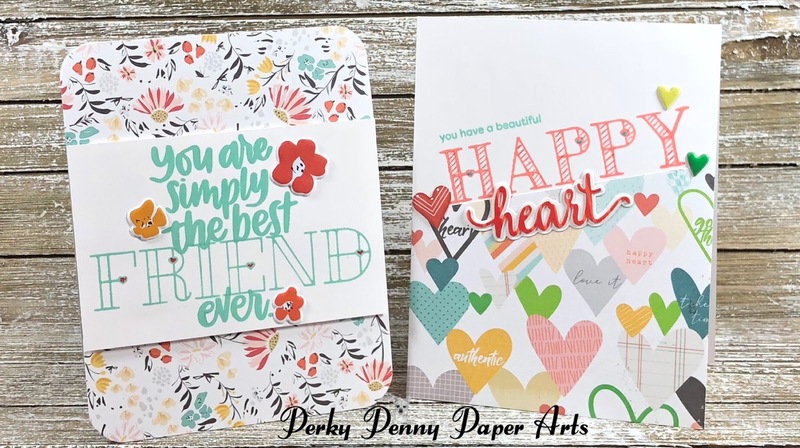 I had so much fun playing with the May 2018 Kind Heart Kit from Simon Says Stamp. I created 8 pretty cards which I am so happy to share with you today. I took advantage of the huge masking paper included with the kit and created masks for each of the images in the Everything Together stamp set (but not the sentiments). You will see below how I used them. I have saved all of the masks and I'm storing them with the kit so that I can reuse them in the future. I like to call Card 1 a one layer wonder. I measured my sentiment and cut a piece of the masking paper just slightly larger. I centered it in the center towards the top. This gave me a 1/2" border on 3 sides and a slightly thicker border on the bottom. Kind of like a Polaroid photo which I thought was kind of fun. I then used my flower and leaf masks to determine placement and create a flower border around my masked rectangle and removed the masks when I was done. Before I removed the rectangle, I took a Gold Signo gel pen and drew a square around the edge of the masking paper, creating a beautiful shiny frame for my sentiment. I then put the card into my MISTI and positioned the sentiment to stamp in the white space. I stamped it in beautiful Delicata Gold ink several times to get a nice rich finish. I also think this would be fun if you masked the outside and created a pattern inside and drew a frame around the space before removing the outside mask to reveal a pretty white border. To see me create this and another card check out my YouTube video here. For Card 2, I stamped and masked and stamped again until I had a spray of flowers at the top stamped in the two colors included with the kit and two additional Simon Says Stamp colors. I then took the dashed stamp and selectively inked up the stamp to create different lengths of lines coming down from the flowers. I then attached similarly colored epoxy hearts to the ends of the lines and finished it off with another sentiment from the kit. For Card 3, I cut the heart patterned paper down to 4 1/4" x 5 1/2" and then cut it on a diagonal. I then took the striped pattern paper and cut out each of the skinny "washi" strips. I used 2 of them plus a scrap from my first card to create an arrangement of strips for the card on the left below and then used part of the largest strip to create a thin border for my heart paper. I then attached everything to an A2 card base. After assembling the card I attached some hearts to the top to create more dimension and interest. The sentiment is from the puffy sticker collection. Card 4 is made using the beautiful wildflower paper. I cut 2 strips to 4 1/4" x 1 1/2" and attached them to each end of a top folding A2 card base. I did stamp surgery on one of the sentiments from the stamp set by cutting off the "ever." I first stamped the "friend" stamp from the Simon Says Stamp Stained Glass Love stamps on a 4 1/4" x 5 1/2" white card stock panel. I then stamped the "you are simply the best" slightly over the "friend" stamp to make them seem attached. Underneath the "friend" stamp, I did the same. These were all stamped in the same Simon Says Stamp Spring Rain Hybrid ink. I trimmed the panel down to 4 1/4" x 2 3/4" and popped it up in the center of the card with foam tape. I colored the heart with red pencil and added a few puffy stickers for some added interest and dimension. The card was complete after I used my We R Memory Keepers Corner Chomper to round each of the corners. For Card 5, I used the other half of the heart patterned paper from Card 3. I attached the patterned paper to the bottom of an A2 top folding card and put it in my MISTI. I then lined up the "HAPPY" stamp from the Simon Says Stamp Stained Glass Love set to the edge of the patterned paper and stamped it with Coral Reef Hybrid ink. I then stamped a sentiment from the Take Heart stamp set from the kit in Spring Rain ink, just above the "Happy" stamp. I then took a Pompeian Red Polychromos pencil and drew diagonal lines in the "Happy" to create a little more interest. I die cut the heart dies that came out of the kit from white card stock. I cut the "heart" word out twice to be able to stack them. I used a direct to paper technique with one of the words using the Coral Reef ink so that the word would coordinate with the stamped sentiment, and then glued it down, slightly overlapping the "Happy." I added a few puffy hearts around the entire sentiment and this card was done. I love the pretty mint paper that came in the kit and decided to create a card with it as the show piece (Card 6). I cut an A2, top folding, card base out of the Simon Says Stamp Audrey Blue card stock that came in the kit. The layering pieces are white cut to 3 7/8" x 5 1/8"; the patterned paper is cut to 3 3/4" x 5"; and the sentiment panel, 3 7/8" x 1 1/2". I layered and glued the panels to the front of the card and then I stamped the sentiment using my MISTI and the Spring Rain Hybrid ink. I finished by adding a few stickers from the puffy sticker pack to create a stemmed flower to place next to my sentiment. I love the monochromatic look of this card. It is so peaceful. For Card 7, I stamped the teacup flower arrangement once on a piece of the mint patterned paper in Spring Rain ink (just the teacup because I would be fussy cutting it to paper piece); once with brown ink on a 4 1/4" x 5 1/2" piece of white card stock; and once on a scratch piece of card stock (to practice coloring and to cut out and pop up larger flowers on finished card). I cut out the patterned paper teacup and set it aside to wait for assembly. I colored the remaining flowers and leaves using an assortment of Faber Castell Polychromos pencils (Cadmium Orange, Dark Chrome Orange, Leaf Green, Dark Cadmium Orange, Light Green, Cobalt Green, and White). I then took a piece of patterned paper and trimmed it to 4 1/4" wide and attached it to the bottom of the card panel, overlapping the stamped teacup creating the impression that the bouquet is sitting on a table. I then fussy cut the 2 large flowers out of my scrap/test piece and popped them up on top of the card panel with 2 layers of foam. I popped the patterned paper teacup with only 1 layer of foam. I stamped the sentiment in Memento Rich Cocoa ink and applied some Spectrum Noir sparkle pen to the flowers to add some shine. The background for Card 8 is the thin lined triangle background paper (cut down to 4" x 5 1/4"). I created the background of this card by stamping flowers from Everything Together stamp set onto the cut down piece of patterned paper. To determine my positioning, I placed the pre-stamped and cut out masks on the card front. Once I had determined placement I moved the masks and stamped. If I was layering another flower underneath, I used the mask, then reapplied it to the backer sheet for future use. I used the third and fourth My Favorite Things Stitched Circle Stax dies. I cut the larger one from the Smoke card base and the smaller one from a scrap of white card stock. The white circle is stamped with a sentiment from the Everything Together stamp set in the Spring Rain ink. To assemble the card, I used tape runner to attach the patterned paper to the card base, and to attach the 2 circles to one another. I popped the circle sandwich up with some foam tape. I completed the card by adding some random dots and hearts from the Everything Together stamp set plus an epoxy heart. 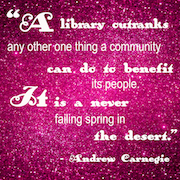 And then some sequins to the card background.